While it isn't officially the end of week 1, I feel like it is an appropriate time to provide an update! Mostly because I have spent the last 5 days SICK! I was the lucky recipient of whatever nasty cold bug is floating around DC and it totally took me out for most of the week. Today is the first day that I am starting to feel normal again! So while I did adhere to program guidelines, it was only be default. My appetite was minimal and most of my meals consisted of eggs, chicken broth, beef stew, and hot tea. Pictures would have been redundant! My FAVORITE breakfast now. 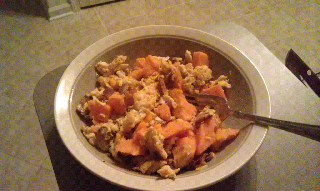 Scrambled eggs, bacon and a sweet potato all mashed together. It looks a bit gross, but it is filling and delicious. I think I ate this 4 out of the last 5 days for breakfast! 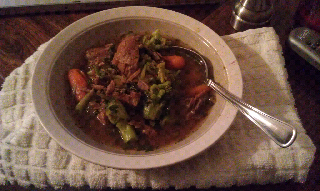 I made a big pot of beef stew on Monday and it lasted me through the whole week for lunch and dinner when I needed something more substantial then just chicken broth. I added a bunch of kale to thicken it up. YUM, kale always to the rescue! It has been a slow year in terms of getting back on a regular workout schedule, so I am optimistic that now that I am feeling better next week will be the return of a workout routine. I am itchy for some really good workouts and sore muscles! Overall, spending week 1 sick was not ideal. My sleep was off, I wasn't hungry and I hardly moved from my couch. As my taste-buds start to come back and workouts start to happen, Week 2 may be more challenging. Time to hit the grocery store to stock up on food for the week! Yay for feeling normal again! Got to know your favorite breakfast:) I hope you are feeling better now. sometimes its good to get sick, so we can realize show blessing it is to be healthy. Take care!